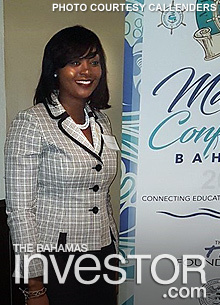 Callenders law firm attorney Syneisha Bootle was addressing the two-day LJM Maritime Academy Conference 2017 at Melia Nassau Beach. “The opportunities associated with a successful maritime industry are infinite. As the third pillar of our economy, following tourism and financial services, more emphasis and resources should be deployed to further develop the maritime industry in The Bahamas,” she said, noting the broad spectrum of businesses and industries that cut across and through the maritime sector from shipbuilding and repair to sophisticated financial services. “The maritime industry involves a range of different sectors – ship building, ship sale, purchase and lease, ship mortgages, insurance, finance, transshipment, ship repair, port personnel, engineering etc. If we intend to regain our place on the world stage, we will have to look beyond just ship registration and develop other sectors within our maritime industry to provide a more holistic maritime experience,” said Bootle, who recently called for The Bahamas to update maritime legislation, some of which dates back more than half a century. To the cadets and experts gathered for the 2017 Academy Conference, she said little stands in the way of The Bahamas charging out ahead of competitors in the constantly growing maritime world. According to Bootle, who earned her Master’s in Maritime Law from the International Maritime Law Institute in Malta, The Bahamas is well on its way to becoming the regional maritime hub for the sector. Bootle’s advice: explore public-private partnerships to further develop the established infrastructure, educational facilities and make the Sea Air Business Centre a reality, review and update legislation, including the enactment of treaties ratified, further establish the yacht registry and in the near future create a super yacht registry to attract the newest class of popular built vessels. Sandals Resorts International has invited over 6,000 travel agents across the US and Canada to attend a series of promotional events. Bahamas Ministry of Tourism representatives traveled to Halifax, Nova Scotia during a recent Bahamas Tourist Office Canada sales mission to promote The Islands of The Bahamas and attract Canadian visitors to the destination.